Tomorrow's run is definitely ON, and the weather seems to be clearing for a dry - and even sunny - jaunt. It is confirmed that there will be a relaxed group led by the marvellous Marge. I have seen quite a lot of social media chat about events happening up at the park on Saturday morning so please make sure you are early to avoid having to queue for a long time at the gate. Also, if you see the SANParks gatekeeper trudging up the hill on foot, please pick him up! Have lots of fun! Take lots of pictures! This Saturday 1st September we'll run our Silvermine circuit: "Three Lookouts and a Peak". Starting from the dam car park, we head up to the Tokai fire lookout, then along the single track to the Blackburn Lookout, and finally along either the Panorama path or the Jeep Track but either way vía Noordhoek Peak to the Noordhoek Lookout. From Noordhoek Lookout back to the start there are several single track options for the group leaders to choose from on the morning, including an extension down the River Walk towards the main gate and back up. The Silvermine gate is due to open at 7am from September 1st but please allow time to queue, pay and drive from the gate up to the dam. RV in the car park at the dam at 7:20 am ready to start at 7:30 am. We will aim to do 10 -12 km – taking in the region of 2-2,5 hours. Our runs are pack runs and we will split into a few pace groups on the day. The route consists of jeep track and single track. No Dogs allowed on our runs. Water, whistle, warm, wind or waterproof top depending on weather and your ICE information. 22 runners braved the weather for today's run. We got wet, cold and nearly blown off the mountain - but exhilarating at the same time. Welcome to Darna - who has moved down from Jo'burg and we must give her a 'medal' - for coming out and sticking with us considering the weather conditions were a 'challenge' . Distances between 10 and 14 km, taking just over 2 hours. The 3 groups did versions of the planned route, with the medium and faster group tackling the rock scrambling Cecelia Ridge. A couple of us met at La Parada for coffee/breakfast to celebrate our 8th birthday. On Saturday we will be running in Cape Point from Buffelsbaai, but this time we will be running south towards Cape Point. 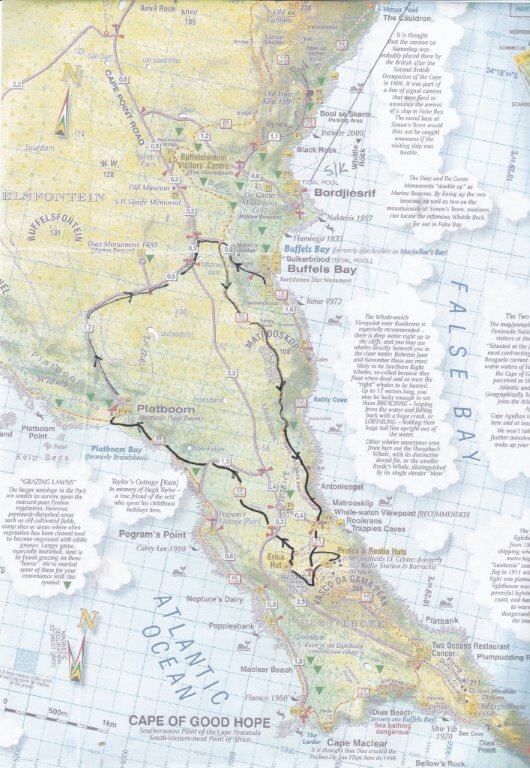 A new route for us with beautiful views of False Bay and the Atlantic Ocean. Lots of route options! From Buffelsbaai parking (NOT the Buffelsfontein Visitor's centre!) we run up the tarred road till we come to the single track crossing. This time we turn left and follow this path south towards Cape Point overlooking False bay all the way. We can deviate to the Whale watch viewpoint to check if the whales have woken up, then back track on to the path and continue south crossing the jeep track and then bear right at the junction to the Erica Hut (part of hoerikwagga trail). We will now have almost done a U-turn and will be running north crossing 2 roads before heading down the Atlantic Ocean at Platboom. This will be around 7km. From here we head up the road and run back to Buffelsbaai giving us around 11km. Another route option is to continue south and not turn to Erica Hut. 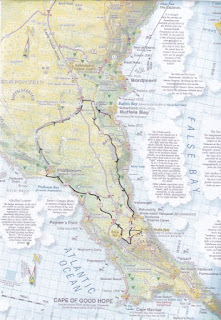 This will take us to the Two Oceans Restaurant, then there is a sandy, boulder hopping route along the coast meeting up at Platboom - this adds about 6km to the route. For those that want a longer distance on trail, from Platboom they can continue along the track to GifKommetjie - but they need to organise to be picked up at Gifkommetjie . Will follow one of the longer routes - to be decided on the day. Relaxed Group to be confirmed on Friday . We rendezvoused at Newlands Forest car park, near the helicopter base, ready to start at 07h30. It was a chilly morning but dry and the sun is beginning to come up earlier, so it wasn't completely dark. There were already quite a few cars in the car park but we found each other in the crowds. After a brief briefing, we started off in a south-westerly direction. We followed the southernmost boundary of the forest, the fast group sticking to the jeep track while the Mediums and Relaxeds took an overgrown single track and continued the tradition of getting lost. Just slightly. Fortunately, we (the Mediums) had Jana B with us, and she provided a much better sense of direction than Lorraine's Endomondo app. 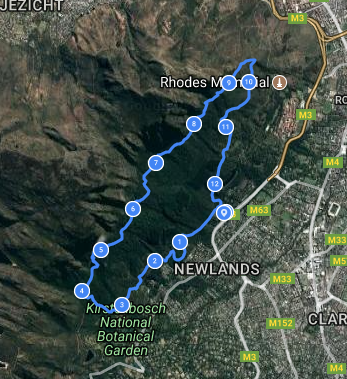 On her instructions, we turned up towards contour path that led us towards Kirstenbosch and did a bit of bundu bashing before finding the contour path at the big rock with no name, to the north of the Aloes, but close enough. We then ran along the contour path, over the rocky section and on to the boardwalks, emerging at the turnstile where the group split into 3: one returning via the steps above Rhodes Memorial, one continuing along the jeep track before turning back per the map, and the third, Melanie and Nothemba, ending up doing 20km via the Blockhouse! The Fasts and the Relaxeds arrived back at the cars before any of the 3 Medium groups but all were safe and happy when they did finally arrive. We were 24 in all today, and lots of familiar faces returned after their various sabbaticals. The Fast group did 12km in 1 hour 40 mins. The Medium As did 11kms in 2:06 hours, Medium Bs did 12,5 kms in 2:27 and the Medium Cs did 20km in their own time. The Relaxed Group did a shortened route; time and distance to be advised. This week's coordinator was Lorraine Nevin.